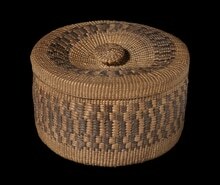 Item number 1938.36.1929 .1 - .2 from the Pitt Rivers Museum. 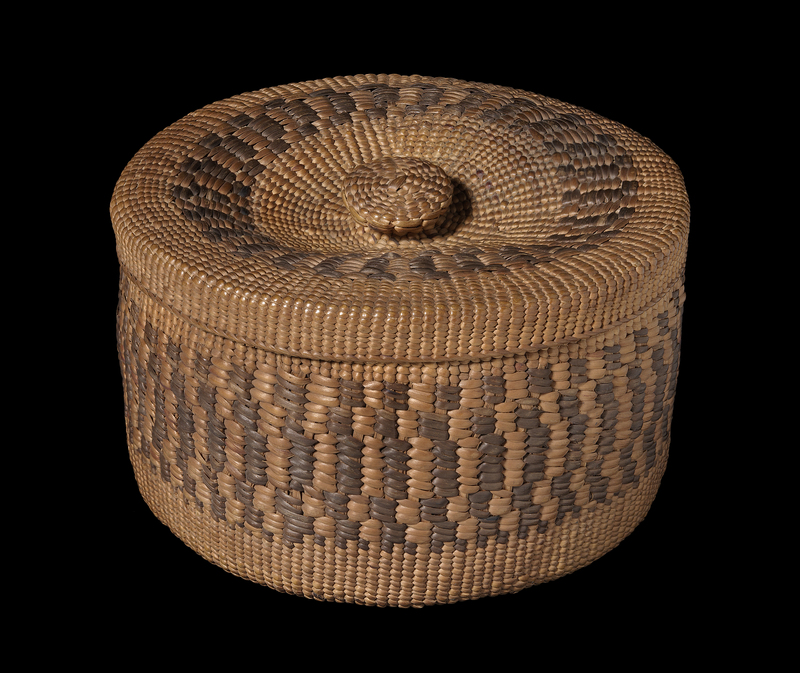 This basket was viewed alongside other basketry items on Monday Sept 14, 2009. This basket generated a lot of discussion. Requests were made for photographs of the inside and bottom of the basket. Nika Collison remembered her nunni [grandmother] weaving a similar pattern as a hat. Nika commented that there are multiple warps on both sides, and that the roots were twined. She noted that the result is a stronger base when there are two warps, and also that this basket was is a recognisable Haida style. Kwiaahwah Jones recollected Haida master weaver Dolores Churchill saying that she believed all old Haida baskets were double warped. Kwiaahwah thought the design pattern might be: strawberry, cockle, strawberry. She also observed that the wrapping warp is securing with twining and that there may be a signature to the design. The style of the base is different to the typical twining used. The material was identified as the inner part of spruce roots. Candace Weir and Vince Collison added that the darker colours in the basket are created by dying the roots. Both the red and brown colours can be achieved by using various berries. Delegates wondered if this basket was made for the tourist trade because it has a lid. Christian White also thought the different pattern on this basket might indicate its manufacture for trade. Accession Book Entry - Collection made by MISS BEATRICE BLACKWOOD, in 1936-37 in NEW GUINEA & NEW BRITAIN. & in the United States and in Mexico, 1939.... 1943... - N. AMERICA, NORTHWEST COAST, HAIDA INDIANS. Circular basket with lid, twined technique, of spruce root. Panel of triple twining in natural and black. Diam. 14.1 cm., depth incl. lid 8.0 cm. Coll. in 1925.